Highlights: Visit Ben Thanh market with the chef before heading to the kitchen to learn with professionals. 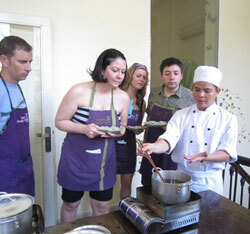 Hands on Vietnamese cooking class with famous dishes such as Pho, Spring Rolls or Tamarind Crab. Understanding the food is a great way to experience the culture of the country. Vietnam culinary art has been widely acknowledged as a superb cuisine. It is a fabulous balance between ying and yang featured in its harmonious formula of green vegetables & fresh meat seasoned with mild spices. You will discover how to shop for and cook for an authentic Vietnamese meal in this hands-on cooking experience. You will be met at your hotel by the chef and taken to lively Ben Thanh market where you will discover the exotic vegetables, spices and herbs that will be used in your cooking lesson. Continue on to cooking centre where the chef will demonstrate the preparation of typical Vietnamese dishes before you “ become the chef” as you prepare and sample the dishes you and your fellow classmates create. Finish the tour after you have had your lunch/dinner. Highlights: This trip is specially designed for those interested in the American war & Australian vegerans. You have chance to visit former battle field such as Long Tan Cross, Nui Dat SS Hill, Long Phuoc tunnel, this trip also a combine with enjoy short relaxing in Vung Tau. Take a ride on a cyclo for an adventure winding through the sights, sounds & smells of this historic metropolis-the ideal way to experience the city at night. Unforgettable 2 hour scenic cruise along the Saigon River in a traditional junk & Vietnamese/ Western dinner. Pick up at your hotel and depart for the trip. Stop off at Ba Ria visit the Orphanage & to pick up your travel permit to the sites. Visit the sight of the former Nui Dat Task Force Base. Little remains of this camp except the columns of the main gate. The former runway is now a wide street in the local village and the old heli-pad is now a soccer field. A school established by the Australians is nearby. Followed drive past the location of the Horseshoe ( access not permitted these days due to mining activity) to the Discourtesy Rubber Plantation. 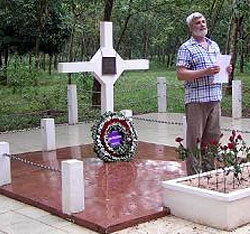 Visit the Long Tan Cross Memorial, before continuing on to the Long Phuoc Tunnels and visit Minh Dam ( no longer the "secret Zone") and Long Hai. Excluded: Personal costs, travel insurance. Highlights: Enjoy this ecological trip exploring the forest by canoe and have a funny moment with monkeys in "Monkey United"
The mangrove forest in Can Gio possesses a high biodiversity with more than 200species of fauna and 52species of flora. The effects of the recent wars on these ecosystems have been devastating and large efforts have been made by local people to rehabilitate the mangroves. Today, it has become one of the most extensive sites of rehabilitated mangroves in the world. Can Gio is a swampy island where the Saigon River meets the sea. 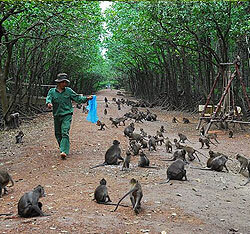 This ecological tour takes you away from the hustle and bustle of Saigon for a unique natural environment. Depart for Can Gio 60km southeast of the center of Ho Chi Minh city. Visit heaps of the long-tailed monkeys have a funny moment in "Monkey United"
Then we will continue to Can Gio seafood market before we head back to HCM city. Included: Tour guide, entrance fee, return ferry ticket, sugar cane juice ( at rest time on the way), food for feeding monkeys, speedboat, Vietnamese style lunch, swimming pool and shower area. Excluded: Drinks at resort, optional activities, travel insurance. Preparation: swimming suit, towel, hat. All quoted prices are subject to change due to money fluctuation and availability.